Hello ... Hello ... my old friends ... It's great to see you once again! I find it quite amazing that there has been so little coverage of the Walk of Stars award granted to Bev Bevan on the night of Thursday 28th April - despite the Royal Wedding and other [so-called] major new stories! 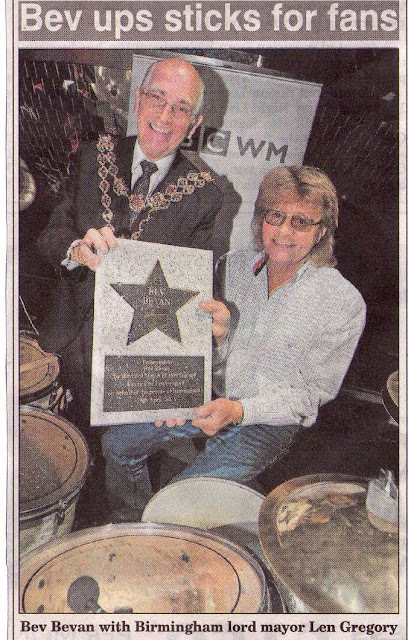 "Legendary drummer Bev Bevan held an exclusive charity concert to celebrate being honoured on the Broad Street Walk of Stars. The former ELO drummer was presented with the award before the sell-out show at Gatecrasher, Birmingham. Bevan invited good friend and fellow rock legend Tony Iommi to perform with him as well as his childhood chum and comedian extraordinaire Jasper Carrott. Iommi and Carrott have both been awarded with a Broad Street star and Bevan attended their presentation events. Bevan, aged 66, joked: "It is wonderful to be in the club. I did start to wonder when it would be my turn!" The Broad Street Walk of Stars honours those people who have made a significant contribution in the categories of music, television, film, radio, theatre, sport or literacy."